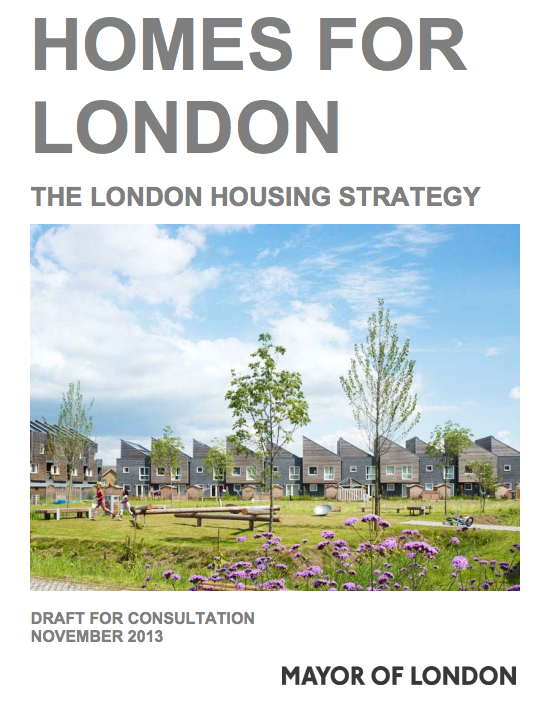 April 2016: Somewhat hidden away on the GLA website (as most things are at the moment…) is a new supplementary planning guidance (SPG) on housing, published a few weeks ago. A detailed history on the lengthy consultation process behind this SPG and its relationship to the London Plan and other key GLA documents is helpfully set out at the designingbuildings wiki, which is worth checking. The SPG includes a series of housing ‘Standards’ which stem from the policies contained in the London Plan’s Climate Change chapter, with the SPG providing further specific guidance on implementing these policies. Standard 35 is of particular importance, as it is concerned with the London’s Plan requirement for zero carbon development: this issue has had a long and complex history – with the SPG’s confirming that new housing development in London will need to be zero carbon from October 2016 is significant – which is covered in further detail in another post here. The SPG also refers to action to mitigate ‘overheating’ in new homes in Standard 36 (linked to Policy 5.9 of the London Plan) stating that new “housing needs to be designed for the climate it will experience over its life, taking into account predicted climate change, the potential for summer heat waves, London’s urban heat island effect and the limits of thermal comfort of future residents”. The GLA’s Preparing Energy Assessments guidance document has also been expanded and updated in line with these changes in the Housing SPG (with a new section 5 entitled ‘Implementation of zero carbon homes (from 1 October 2016)’ added) and is available to download here (or download from this website here). February 2016: “SSE Enterprise Utilities has delivered a low carbon multi-utility solution for a new residential and commercial development on the banks of the Thames. Hundreds of properties at the Riverlight development will be served by an energy centre housing a Combined Heat and Power (CHP) unit, gas fired boilers and ground source heat pumps. Installation and ownership of the water, gas and electricity networks on site means that SSE Enterprise Utilities is providing a true multi-utility service.” Read full SSE news release here. A case study on the project is available here and video here. 23 October 2015: The Mayor has posted his submission to DECC’s Feed in Tariff (FIT) consultation online today (the deadline for the response) alongside a letter to Energy Minister Andrea Leadsom, from Deputy Mayor for Energy & the Environment, Matthew Pencharz. The Mayor has voiced his concerns over DECC’s proposals for some months now (see previous statement here) and his sentiments for a ‘gradual tapering’ echo calls from industry organisations, such as the Solar Trade Association, who have strongly campaigned against the proposed ‘cliff edge’ withdrawal of support for solar, setting out their own recommendations in a ‘£1 plan‘ to 2019.
whilst a move towards smart metering with net metering functionality is welcome, making it a requirement for receipt of the export tariff would require a commitment or obligation on the energy suppliers to install a smart meter in a timely manner, as well as ensuring that the property was currently suitable for installation of a smart meter – an issue which arises frequently in London. The Mayor’s response also raise concerns about the impact of the proposals on community energy projects in London. All in all, this is a significant intervention by the Mayor in what has become a highly politicised consultation. 19 December 2014: A mayoral approval document outlines support to two new projects to save energy and carbon in properties in the private rented sector (PRS) and to boost membership of the London Rental Standard (LRS). Expenditure of £141,000 of capital grant funding and £45,000 of revenue funding including for assessments and testimonial material to support delivery of at least 50 demonstration projects with LRS-accredited landlords, each resulting in a retrofitted PRS home and raising awareness of the benefits that can be achieved. Expenditure of up to £80,000 revenue funding for the development and implementation of a pilot programme to trial the use of incentive payments to LRS-accredited lettings agents for achieving retrofit works on at least 400 PRS properties they let or manage on behalf of private landlords. Expenditure of up to £20,000 revenue funding for the evaluation of both projects. the PRS is the worst performing sector in terms of quality of stock. 17% of PRS tenants are in fuel poverty, while 30% of PRS homes fall below the Decent Homes standard (compared with 10% and 21% across London overall). Questions were raised as to whether the scheme would be replicable on a greater scale. The Group heard that, if successful, the programme could be scaled-up and delivered through energy suppliers or contractors, as part of their marketing budgets. A discussion was held regarding the potential involvement of energy suppliers to incentivise the programme. It was agreed that while this could be looked at for future iterations of the programme, to engage energy suppliers at this stage would complicate and delay the start of the programme. alternative energy for maritime facilities; the Mayor’s Energy Advisor’s letter to the Treasury to support tax incentives to help community energy projects; the Belvedere Energy from Waste plant and the Viridor Energy Recovery plant in Beddington, Sutton; the Mayor’s Energy Advisor’s visit to Shanghai and Beijing; the Mayor’s support for minimum energy efficiency standards in the private rented sector; Crossrail stations using decentralised energy; whether the Mayor supports the call for energy efficiency to be made a UK infrastructure priority; research commissioned by the GLA Environment Team this year costing more than £10,000; Islington Council’s recent success at the Energy Institute Awards; TfL officers responsible for examining the potential for solar energy; and again for the Metropolitan Police Service; TfL’s total electricity spend – and the the proportion of electricity it plans to source for low carbon generators in London; whether TfL has undertaken an assessment of solar PV potential across its estate; meetings the Mayor has had with the London Sustainable Development Commission; the amount of solar PV installed across the Met Police’s estate; and also TfL’s estate; a programme for deploying solar across the Met Police’s estate; the Mayor’s support for Cold Homes Week 2015; Excess Winter Mortality (EWM) statistics for London; the number of children in London living in fuel poverty; the number of Londoners living in fuel poverty; if the Mayor had worked with Public Health England on fuel poverty issues; how the Mayor will be helping London households in fuel poverty this winter; Mayoral support for anaerobic digestion facilities in London; the Mayor’s support to older Londoners in fuel poverty; decentralised energy support unit (DEPDU) work on the North London Heat and Power project; the number of RE:NEW households visited with children; RE:NEW programme progress reports; companies on the RE:NEW programme procurement framework and discussions with Brent Council on fracking. July 2014: The results of a study of the Mayor’s home energy efficiency programme, RE:NEW, has recently been published in major academic journal Energy Policy (which – for once – is freely available online!) focussing on the first major roll-out of phase of RE:NEW, delivered between July 2011 and April 2012, where 50,683 homes underwent a RE:NEW home energy visit. Visits do not generate significant pro-environmental behaviour change. Visits do not overcome the barriers to the installation loft and wall insulation. one of the limitations of the home energy visit was the time constraint on visits. Visits generally lasted about an hour and this was due to a number of reasons. Most of the advisors were employed as contract workers and were paid a fixed price for each visit delivered…there was a focus on the number of visits delivered, rather than the length or quality of the visit. the short visit length meant that advisors did not have adequate time to install all of the easy measures provided during the visit. The effectiveness of visits, specifically in relation to encouraging the adoption of curtailment behaviours, was limited by the expertise of the ‘energy advisors’ who had inadequate training prior to delivering visits. over 70% of the visits to the sample groups in local authorities B and C, the householder receiving the visit was living in rented (privately, council or RSL) housing and did not have control over the potential to install further measures. The paper notes that some of the limitations of the RE:NEW programme have been recognised, and were set out in an evaluation report published earlier this year by the GLA (see earlier post here for background and link to paper). A third phase of the RE:NEW programme has recently been initiated by the GLA. 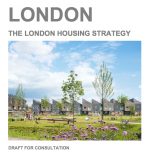 February 2014: On 6 February, the London Assembly Environment Committee held an oral evidence session on the Mayor’s housing energy efficiency retrofit programme, RE:NEW, and its progress to achieving its stated CO2 targets. Details of the evidence session are set out here. A background paper to the evidence session is here. The session was available on webcast and can be viewed here. Huge budget cuts planned to Mayor’s environment programme? 20 December 2013: The Mayor today published for consultation his budget for the GLA group for 2014-15 (press release). The budget document states that a “new look GLA business plan has been published which includes a set of key performance indicators (KPIs) covering all main Mayoral policy and programme activities to be delivered by the GLA.” It’s welcome to see that amongst the 10 “major GLA programmes supporting the Mayor’s ambitions” [p7] a key deliverable will be “retrofitting more of London’s homes and public workplaces, saving carbon and cutting bills” – referring to the RE:NEW and RE:FIT programmes respectively. “The Mayor is continuing to work towards improving London’s environment. 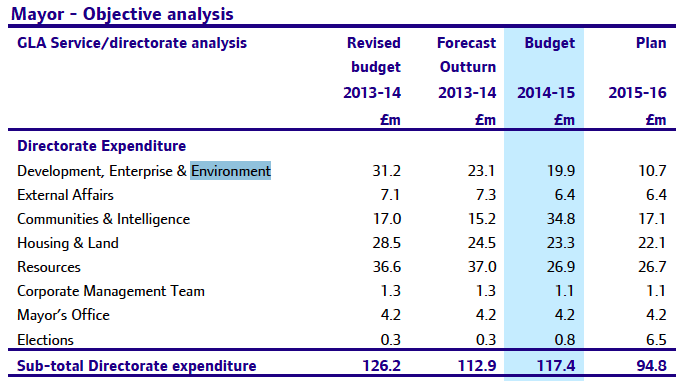 The draft 2013/14 budget for this Directorate seems to be have massively overestimated – the current forecast outturn being 25% lower than predicted. It’s not clear however what is contributing to this huge underspend. The planned reduction in budget for this Directorate far exceeds all others, some of which – like the Mayor’s Office – will remain static over the three year period. All of this may however change markedly following the Government’s recent announcement that it will scale back the level of support going to insulation through the ECO as well as significantly reduce the level of solid wall insulation (SWI) installations: the boost in support to SWI systems was often quoted by Government as being a huge advantage to the Mayor’s retrofit ambitions in London due to the high prevalence of solid wall homes here. Further updated details on the RE:NEW programme.